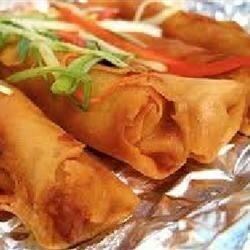 "The traditional Filipino egg roll is small in size, but big on taste. More shrimp can be added to your taste, or omitted altogether. They can also be frozen for later consumption. Serve with store-bought sweet and sour sauce or spring roll sauce (available in Asian grocery stores)." WAS REALLY GREAT ! I FRIED ALL MY INGREDIENTS TOGETHER AND THEN PUT THEM IN THE WRAP ! !